Arriving at Hartham Common, the local walking park flanked on all sides by rivers, Pasha spent a happy half hour running, swimming, rolling and playing. Then he spotted a herd of beautiful black cows, young and old, on the other side of the river. He gave a bark or two, to which he got little response, so he promptly got into the river and, to my consternation, swam across to the other side to say hello. Getting out of the river, he approached the nearest cows to greet them, and they gently looked at him and he at them. So far so good. Then he went to say hello to the youngsters, at which point the mother cows decided to wander over to investigate. As the herd of large cows got closer to Pasha, he backed into the trees at the river’s edge, only to find himself stuck a few foot high on a trunk overhanging the river – with no way back or out…. Turning round to face me, a frightened Pasha started to bark, while the cows just stood their ground and looked on, as if amused. I called him; I waved treats at him; I threatened him; I promised him all manner of good things; I pretended to walk away – all to no avail. There was simply no way Pasha could or would jump from his perch into the water and swim back to safety. What was I to do? I got out my mobile and checked Google maps but the nearest river crossing was far away and getting there would mean leaving Pasha stranded while I drove to find the field with the cows. So that was not an option. As I looked at the river, I was left with a growing dread that there really was only one solution – to swim across the river to reach him. But I was at wearing my office clothes and would have to return to work after this lunch break, with no change of clothes. So what was I to do? The only way would be to swim naked and dry myself with my cardigan – but the idea of streaking in Hertford was not at all appealing. As I pondered my dilemma, getting more anxious by the minute, a middle-aged woman approached, with two border collie dogs. She stopped and asked what was happening, and I told her of my dilemma. She looked at me, looked at Pasha, smiled, and said “I’ll do it, I’ll swim across to get him”! I stared at her in disbelief as she took off her clothes down to her bra and knickers, handed me the lead of one dog and the ball for the other, and set off down the muddy bank with Pasha’s lead over her shoulders. She swam across the river, wincing at the cold water, approached Pasha and attached the lead to his collar. 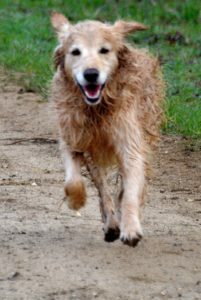 She then encouraged him down from the trunk and back into the water, at which point he promptly swam straight across the river, got out the other side, shook himself and ran off to play with the other dogs – without a word of thanks! The lady swam back and climbed up the bank, where I tried rather ineffectually to dry her with my cardigan, thanking her all the time. “Not a problem at all”, she said. “Last month I got in to help a sheep who’d been chased into the river by a dog!” She then put on her clothes and we walked back together to my car with our dogs playing at our heels. What a kind lady, to help out a dog and woman in distress without a moment’s hesitation… thank you!